Many of the greatest Saints of both the Old and New Testaments are referred to in The Servant of God the Little Daughter of the Divine Will Luisa Piccarreta’s life and writings. Each of these Saints is known in particular for one or more heroic virtues that identify and make them unique from other Saints. The Servant of God Luisa possessed all the Saints virtues to an exceeding degree, being surpassed only by the Blessed Virgin Mary and Our Lord Jesus Christ. The Servant of God Luisa does share with the Blessed Virgin and Our Lord the greatest of all gifts—the living in the Divine Will. Luisa did not have the gift of the Immaculate Conception, only Adam and Eve prior to their fall shared this with Our Blessed Mother. However, Adam and Eve both fell, while Our Blessed Mother remains always and forever Immaculate. The documents under this heading are concerned mainly with Saints as related to the Servant of God Luisa’s life and writings. 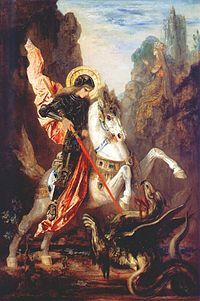 St. George—Feast Day April 23rd. He is a Saint in both the Eastern and Latin Rites, was a soldier in the imperial army, and is Patron of England, Portugal, Germany, Aragon, Geona, and Venice. St. George suffered martyrdom at Lydda, Palestine. To the Crusaders he was the model of the Christian knight because of the legend of him the slaying the dragon. His coat of arms is a red cross on a white background, which became the basis of the uniforms of British soldiers and sailors, and which also appears on the Union Jack. 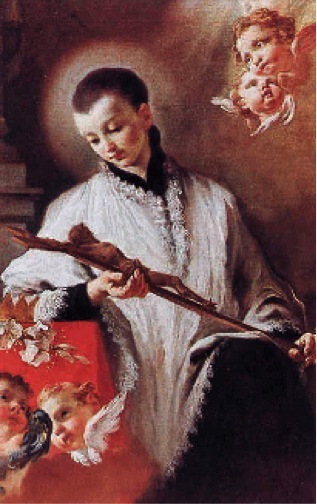 St. Aloysius Gonzaga—Feast Day–June 21st. He is known for his purity and the performance of great austerities and religious practices. St. Aloysius joined the Jesuits in Rome in 1585. He has been declared Protector of young students and Patron of Catholic Youth. Jesus spoke with Luisa about St. Aloysius on June 20, 1899, in Volume 2 of the Book of Heaven. And He: “You too will come. Do you see how beautiful Luis is? But that which was most [beautiful] in him, which distinguished him on earth, was the love with which he worked. Everything was love in him. 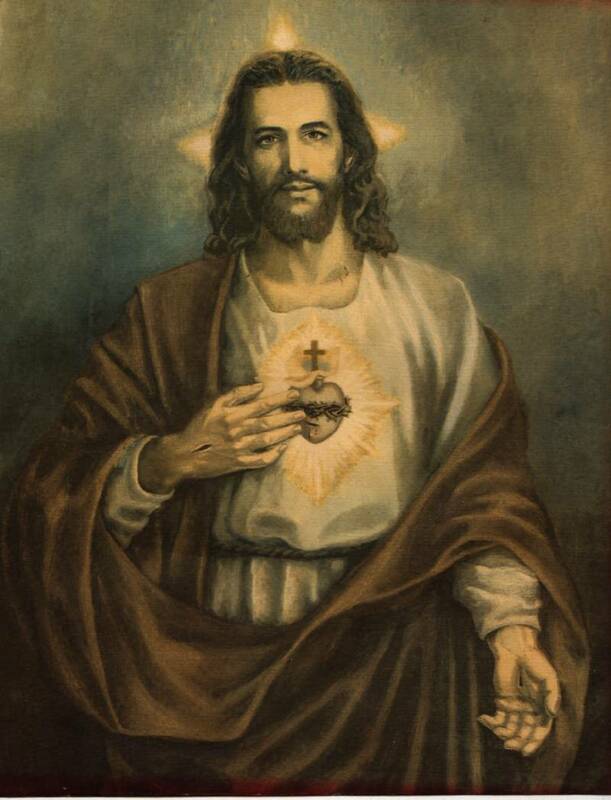 Love occupied his interior, love surrounded his exterior, such that it could be said that even his breath was love. Therefore, of him it is said that he never suffered distraction, because love inundated him all over; and by this love he will be inundated eternally, as you see.” And so it seemed that the love of Saint Luis was so very great, that it could reduce the whole world to ashes. After that, I prayed Jesus that He would bless me and those who I saw at that moment; and He, giving the blessing, disappeared. St. Cathal—Feast Day–May 10th. He was known as the shipwrecked Saint. He is Patron of Corato. Around 685, following the arrival of St. Patrick, holy men established small monasteries throughout Ireland. In the seventh century, a holy man named Cathal, having studied at the University of Lismore, made his way through the pass in the ancient Slieve Cua mountains and arrived at Rathan, where he established his monastic settlement. He was appointed Bishop of the area, even though it should be remembered that in those early years of the Christian Church, this did not mean that he was in charge of a diocese. After some years at Shanrahan, Cathal set out on a pilgrimage to the Holy Land. On his return journey, he was shipwrecked off the coast of Southern Italy. There he realized that the people of the area had reverted to paganism, and he resolved to stay among them in an effort to reconvert them to Christianity. I left that Church to go to pray, but while I did this I found myself in myself. As a young lady, Luisa became a third Order Dominican tertiary, and took the name of Sister Mary Magdala. At the age of 16, Luisa made her profession to Jesus as His victim. From then until the end of her life she remained in a state of almost continuous suffering, enduring both the physical pains of the invisible stigmata, and the more terrible interior pains inflicted by Divine justice. 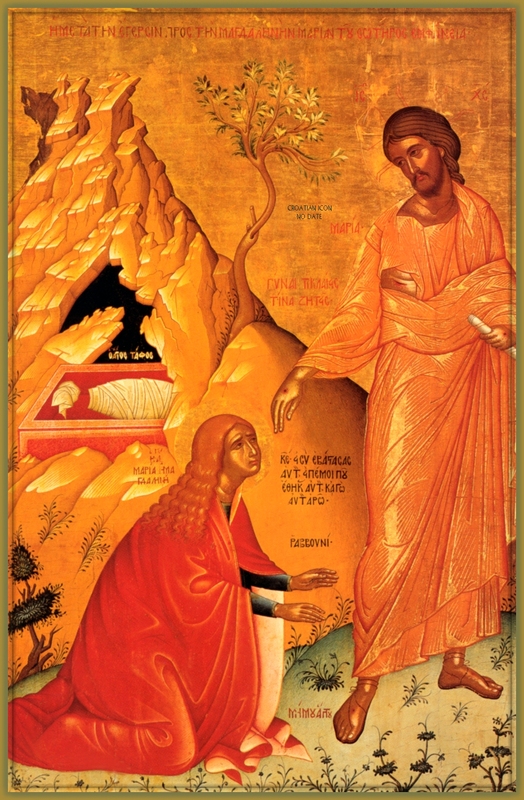 St. Mary Magdalen—Feast Day–July 22nd. She is known for her great love of Jesus. She was the sinner who anointed Christ’s feet in Simon’s house, the sister of Martha and Lazarus, and was at the foot of the Cross at the Crucifixion. 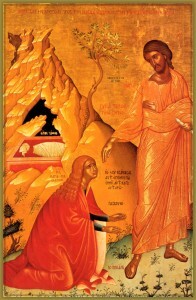 She discovered the empty tomb, heard the Angelic announcement of the Resurrection of Christ, and was the first person to see Christ later that same day. 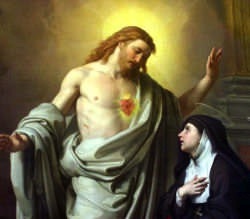 On October 16, 1888, Feast Day of St. Mary Margaret Alacoque, Luisa received the grace of the Mystical Marriage. 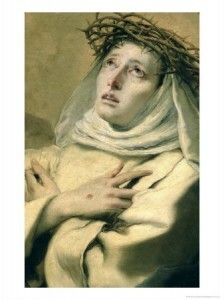 St. Catherine of Sienna—Feast Day–April 29th. She is Patron of Italy, and one of the greatest of Christian mystics. She began to have mystical experiences at the age of six. 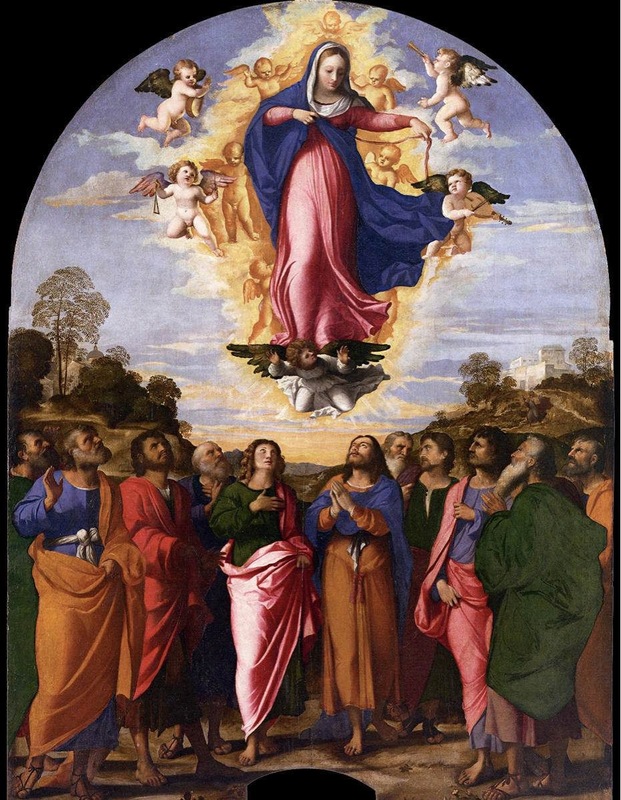 She was a Dominican tertiary, and beginning when she was 16, she experienced visions of Christ, Mary, and the Saints interspersed with diabolical visions and periods of spiritual aridity. She ministered to the ill and condemned prisoners, and was acclaimed for her holiness and abilities as a peacemaker. St. Catherine received the invisible stigmata, which was clearly apparent at the time of her death, and she has been declared a Doctor of the Church. The morning of the aforesaid day, Jesus made Himself seen again—all affable, sweet, and majestic—together with His Most Holy Mother and St. Catherine. First a hymn was sung by the Angels; St. Catherine assisted me, my Mama took my hand, and Jesus put a ring on my finger. Then we embraced each other and He kissed me, and so also did my Mama. The place of the revelation was the church of Prouille and the time was 1208. The claim of place and time are most strongly supported by the tradition of the Dominican Order. Pope Leo XIII repeatedly affirmed the Dominican origin of the Rosary and in a letter to the Bishop of Carcassone (1889), he accepts the tradition of Prouille as the place where the Blessed Virgin Mary appeared to St. Dominic and revealed this devotion. 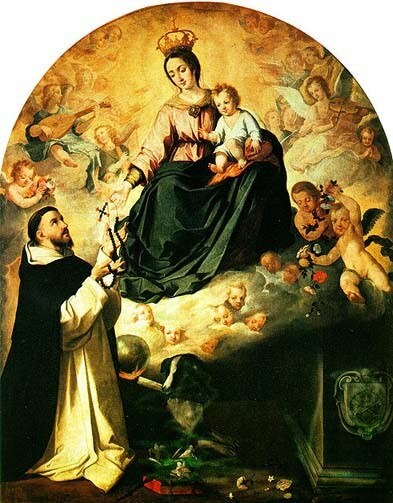 The tradition that Mary first revealed the Rosary devotion to St. Dominic is supported by 13 popes. “While still a child, I kept hearing the name of a woman who had been bedridden for more than forty years. My mother was fond of her, and often spoke about her. Especially in the moments of sorrow and oppression, she would run to her to implore her prayers. After twenty years, I went back to visit this soul again, and I found her always the same: placid with the rosary between her fingers, in attitude of prayer and smiling, working with the fusetti of the tombolo in her hands. Luisa’s parents prayed the Rosary daily and attended Mass as often as they could in the Church of St. Dominic. 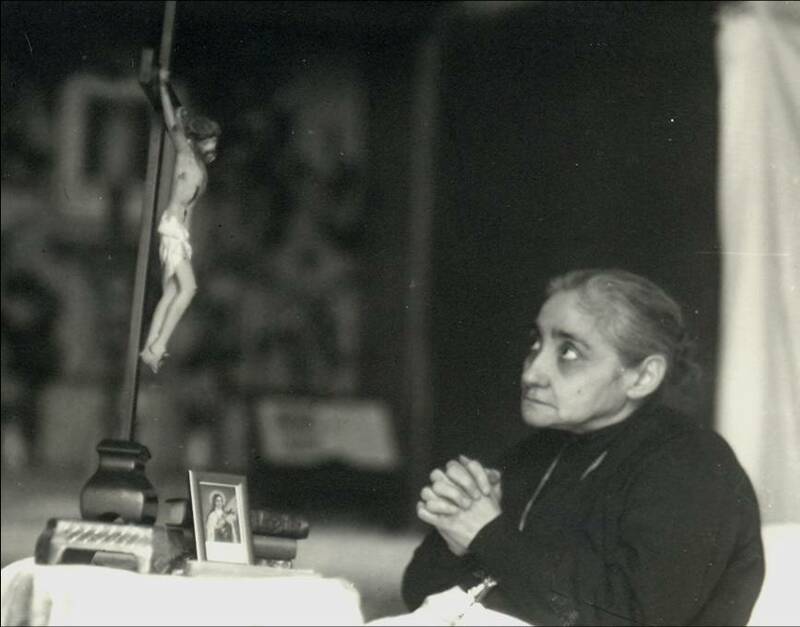 October 7, 1928, the Feast of the Holy Rosary, was the day of Luisa’s entrance into Fr. Annibale’s Orphanage of Saint Anthony in Corato, run then and still today by the order of nuns, the Daughters of Divine Zeal, also founded by Fr. Annibale. Exactly 10 years to the day, on the Feast of the Holy Rosary, October 7, 1938, because of dispositions of the Superiors” (her Confessor says), “because of health reason” (Luisa says), she had to leave the Orphanage of St. Anthony. Fr. Annibale was beatified by Pope John Paul II on October 7, 1990. 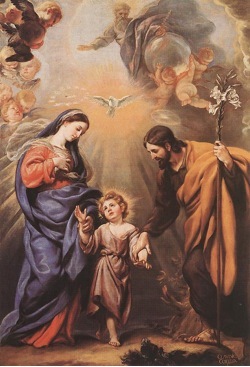 “My brother, have confidence, for you have a heavenly Mother who loves you very much and who will never leave you. 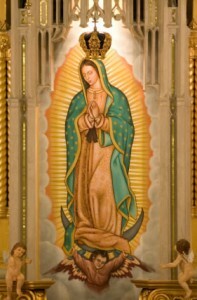 If you listen to her, she will make a sanctuary out of your jail; and if human frailty has borne you to that place, the sovereign Queen will come with the strength of the Divine Will to bear you up to Heaven and to make your days seem less sad…Never neglect the Rosary of the Heavenly Mother. If you have the opportunity, be the jailhouse missionary, making it known that the Queen of Heaven wishes to visit all the inmates to give them the gift of the Divine Will. If you need anything else and cannot pay for it, you can count on me. I will see that you receive it free of charge. 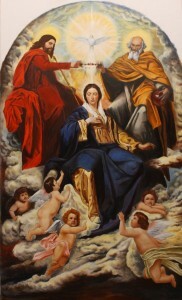 The Most Holy Trinity crowning Our Lady: Daughter of the Father, Mother of Our Lord Jesus Christ, Spouse of the Holy Spirit and Queen of the Divine Will—Feast Day of Her Birth–September 8th. Eleven months after Luisa’s Mystical Marriage, on the Feast of the Birthday of Mary, September 8, 1889, Jesus took Luisa out of her body to Paradise to renew their Marriage in the presence of the Most Holy Trinity. On this occasion, Luisa was given the possession of the “Gift” of the Divine Will, her new “birth” into the Kingdom of the Divine Will. “My daughter, the Immaculate Conception of my beloved Mother was so miraculous and marvelous that Heaven and earth were filled with wonder and made merry…. how could We resist so innocent a creature, possessed by the power and holiness of our Will? That would be to resist Ourselves. We discerned in Her our divine qualities; the reverberations of the divine attributes flowed upon Her like waves, the reverberations of our Holiness, our Love, our Power, etc. It was our Will within Her that attracted all these reverberations of our divine qualities and Which was the crown and the defense of the Divinity dwelling within Her. If this Immaculate Virgin had not possessed the Divine Will as the center of her life, then all the other prerogatives and privileges with which We enriched Her would have amounted to nothing. It was this that confirmed Her and preserved her many privileges. Indeed, It constantly increased them. “This is the reason We made Her Queen of everyone (when We act, We do so with reason, wisdom and justice): She never gave life to her human will. … All created things…seeing this sublime Virgin Who, almost as though She were their sister, had never wanted to know her own will but only that of God, they not only celebrated but felt honored in having Her for their Queen. They ran about Her, paying Her homage by putting the moon beneath her feet as her footstool, the stars as her crown, the sun as her diadem, with angels as servants, and with men attending Her. Absolutely everyone honored Her and paid Her homage. There is no honor or glory that cannot be given to our Will, whether It acts in Us, Its own home, or whether It dwells in creatures. The Greek Schism occurred in 1054 when the exchange of excommunications between the Greek and Latin Sees took place in the Diocese of Trani. Another schism, the Great Western Schism, occurred in reaction to the legitimate election of the Archbishop of Trani, Urban VI, as Pope. Two great Saints were involved in settling this schism, St. Catherine of Sienna and St. Vincent Ferrer, both of whom were among the Saints mentioned by name by Luisa in the Book of Heaven. God, by always drawing good out of evil, has destined the site of these and all schisms to become the birthplace of a spiritual renewal that will bring the traditions of Eastern and Western Christianity to a glorious fruition in the Kingdom of the Divine Will. 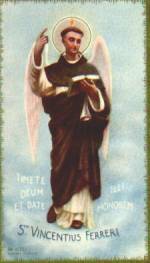 St. Vincent Ferrer—Feast Day–April 5th. He is a famous Dominican missionary and miracle worker who traveled all over Western Europe preaching penance for sin, and preparation for the Last Judgment. Many believed he had the gift of tongues. He helped to end the Great Western Schism. 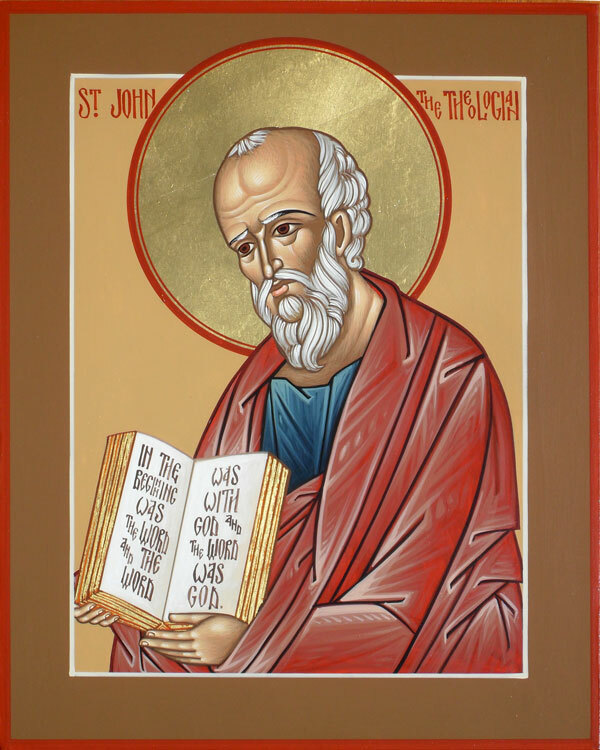 St. John the Evangelist—Feast Day–December 27th. He is the son of Zebede and brother of James the Greater, the two of whom were referred to as “Sons of Thunder.” He was also a fisherman, the youngest of the Apostles, and the “Beloved Disciple.” He was, along with Peter and James, among the ones closest to Christ, and was present at the Transfiguration—as well as being the only Apostle present at the Crucifixion. Jesus placed Mary in his care. He was the first Apostle at the tomb on Easter morning, and is the author of Revelations and three other Epistles. He was known as “The Divine,” and is represented in art as a soaring eagle because of the majesty of his gospel. “The exact point you will find on Calvary. I, Priest and victim, [who was] raised on the wood of the cross, wanted a Priest who would assist Me in that state of victim, which was St. John, who represented to Me the nascent Church. In him I saw everyone—Popes, Bishops, and Priests—all together. And he, while he assisted Me, offered Me as victim for the glory of the Father and for the success of the nascent Church. 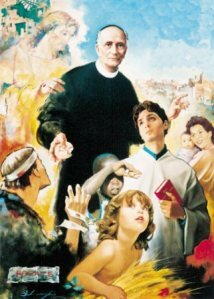 “That a Priest assisted Me in that state of victim did not happen by chance, but everything was [a] profound mystery, predestined even ab eterno, “from eternity,” in the Divine Mind—meaning that [by My] selecting a victim soul for the grave needs which exist in the Church, a Priest offers her to Me, assists her for Me, helps her, and encourages her to suffer. If they understand these things well, they themselves will receive the fruit of the work which they render, like Saint John—how many benefits did he not have for having assisted Me on Mount Calvary? If [they do] not, they do nothing other then put My work in continuous disputes, taking away from Me My most beautiful designs. But who can say everything that He said to me, and explain the least meanings? I have said it as best I can, as I have known how to say in my coarseness. I hope that the Lord will do the rest, illuminating them to make them understand what I have not known how to manifest well. St. Philip Neri—Feast Day–May 26th. He entered the religious life as the result of a mystical experience, and founded the Confraternity of the Most Holy Trinity. He is known for spreading the Forty Hours Devotion, and is also known as the Apostle of Rome and Patron of Rome. He had the ability of looking into men’s minds. He experienced ecstasies and visions, performed miracles, and had the gift of prophecy. 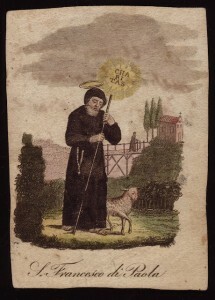 St. Francis of Paola–Feast Day–April 2 – Francis was born at Paola, Italy and was educated there at the Franciscan friary of San Marco, and when fifteen became a hermit near Paola. In 1436, he and two companions began a community that is considered the foundation of the Minim Friars. He built a monastery where he had led his eremitical life some fifteen years later and set a Rule for his followers emphasizing penance, charity, and humility, and added to the three monastic vows, one of fasting and abstinence from meat; he also wrote a rule for tertiaries and nuns. He was credited with many miracles and had the gifts of prophesy and insight into men’s hearts. Francis died on April 2nd and was canonized in 1519. Thus I felt all this in my soul: That if I knew the Will of God with complete clarity, I would be ready—at the cost of my own life—to follow this, His Holy Volition. Therefore I remained calmer. Thanks be to God always! 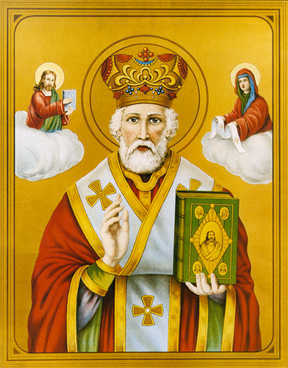 St. Nicholas—Feast Day–December 6th. He was Bishop of Myra. 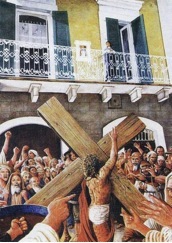 He was known for his holiness, zeal, miracles, devotion to the conversion of sinners, and giving his wealth to the poor. He is Patron of Sailors, Greece, Apulia, Sicily, Lorraine, and Russia. In the year 1087, the relics of St. Nicholas of Myra were transported to the port city of Bari in Apulia, Italy. St. Nicholas ranks next to the Blessed Virgin as the Saint most universally loved in the two great centers of Eastern Christianity, Russia and Constantinople. St. Nicholas appears more often in the Christian art of East and West then any other Saint, except for the Madonna. St. Nicholas is the Patron Saint of Apulia, of Greece, of many cities in Europe, of Russia, and, very importantly, of all children (including the Little Children of the Divine Will). In Russia, upon whose conversion (according to Our Lady of Fatima) the peace of the world depends, devotion to St. Nicholas has endured. Up until the Communist Revolution of 1917, crowds of Russian pilgrims flocked to the Saint’s relics in Apulia. The Russian Orthodox Church still celebrates the Liturgical Feast of the transfer of the relics of St. Nicholas from Myra to Bari. Luisa Piccarreta’s father bore the name Vito Nicola in honor of Apulia’s Patron, the special Patron of Catholic Christian unity. Poland, the birthplace of the Divine Mercy message, and also of our current Holy Father John Paul II (who is identified as Mary’s “Masterpiece” in a message of the Blessed Mother to Fr. Gobbie), points to a more positive sign of the times—the gradual reconciliation of the Eastern and Western Churches. The period between Luisa’s death and the opening of her cause for beatification coincided with a grace-filled movement toward reconciliation between the Church of Rome and the ancient Churches of the East, especially the Orthodox Church. As a meeting place for the Latin Rite Catholics of the West, and the Orthodox and Byzantine Catholics of the East, Poland gave to the world the devotion to the Divine Mercy that combined the Trisagion prayer of the Byzantine liturgy “Holy God, Holy Mighty One, Holy Immortal One, Have mercy on us and on the whole world” (Divine Liturgy of St. John Chrysostrom), with the use of the Rosary. Luisa is also connected to this same prayer, which the Priest would say while at the same time making the sign of the Cross on her hand to command her soul to return to her body. This connection between Luisa and Poland, the home of our present Holy Father John Paul II, is made even clearer by the date of Luisa’s death on March 4, 1947—the Feast Day of St. Casimir of Poland. 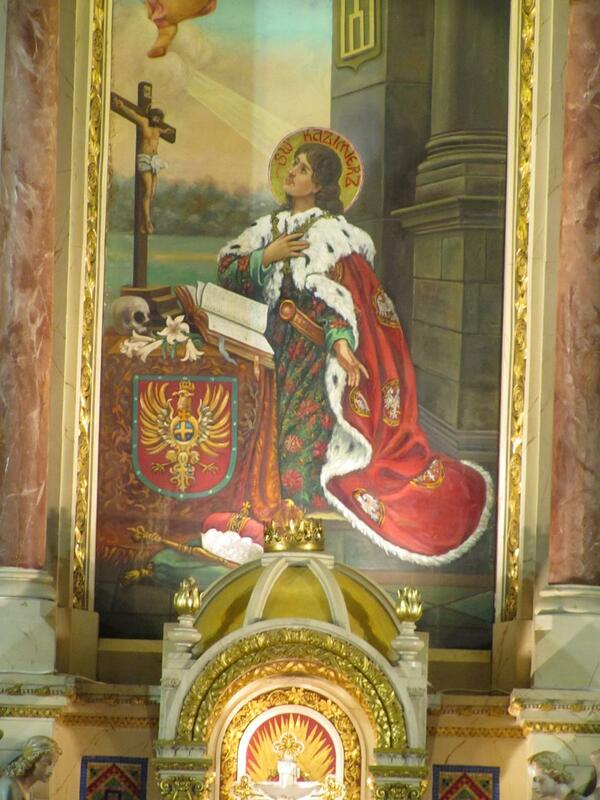 St. Casimir of Poland—Feast Day–March 4th. He was third of the 13 children of King Casimir IV of Poland and Elizabeth of Austria, daughter of Emperor II of Germany. He was born at the royal palace in Cracow on October 3rd. Casimir made the decisoin to committ his life to God at an early age, despite presure and ridicule from his family. Casimir found the luxuries around him to be only temptations away from the true royalty of God. He resolved to live his life in simplicity, and follow the way of Christ. Casimir died at the young age of 23 from lung decease. Many miracles were reported at his tomb, and he was canonized by Pope Adrian VI in 1522. 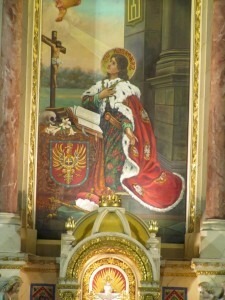 He is the Patron of Poland and Lithuania. 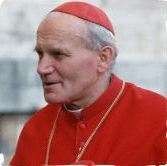 As Cardinal Archbishop of Cracow, Wojtyla ordered a theological review of Sister Faustina’s diaries, which had been condemned by the Holy See. As a result of the inquiry, the prohibition against the spread of her writings was removed. Six months later, Wojtyla was elected to the Chair of Peter. As Pope John Paul II, he published one of his first encyclicals on the Mercy of God, and acknowledged the importance of Blessed Faustina and her writings by beatifying her on the Feast of Divine Mercy. 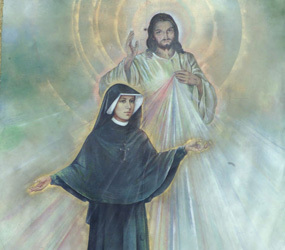 The beatification of Blessed Faustina attracted new interest in the prophetic content of her diaries, which predicted the Second Coming of Jesus. “I have always wanted to become a saint. Unfortunately when I have compared myself with the saints, I have always found that there is the same difference between the saints and me as there is between a mountain whose summit is lost in the clouds and a humble grain of sand trodden underfoot by passers-by. Instead of being discouraged, I told myself: God would not make me wish for something impossible and so, in spite of my littleness, I can aim at being a saint. It is impossible for me to grow bigger, so I put up with myself as I am, with all my countless faults. But I will look for some means of going to heaven by a little way that is very short and very straight, a little way that is quite new. Her one dream as the work she would do after her death, was helping those on earth. “I will return,” she said “My heaven will be spent on earth.” She died on September 30, 1897 at the age of 24 years old. She herself felt it was a blessing God allowed her to die at exactly that age. She had always felt that she had a vocation to be a priest and felt God let her die at the age she would have been ordained if she had been a man so that she wouldn’t have to suffer. Jesus is jealous that someone else may comfort the soul. 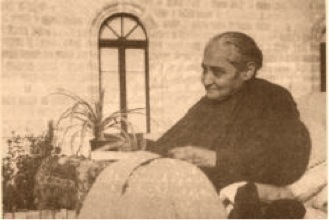 1910 was also very important because in 1910, while visiting the Trani Diocese to establish an orphanage, Father Annibale Di Francia met Luisa Piccarreta for the first time, most likely at the suggestion of her confessor, Fr. Gennaro Di Gennaro. These greatest of all Saints in Heaven are working to establish the Reign of the Divine Will on Earth. Of all of these, the Saint closest and most important to Luisa and her cause is her special confessor, Saint Annibale Maria Di Francia. Several witnesses relate that one day Father Annibale came to the house of Luisa more content than ever, and said that he had brought this book to the Holy Father,Pope Saint Pius X, who had received him several times in private audiences. Father Annibale was reading him one of the Hours (that of the Crucifixion), when the Pope interrupted, saying: “Not this way, Father, but kneeling one must read. It is Jesus Christ that is speaking.” Finally, Father Annibale, as Censor of the writings, obtained the Imprimatur from His Excellency the Archbishop of Trani for the volumes written by Luisa (at that time there were already nineteen). Pope St. Pius X—Feast Day– August 21st. 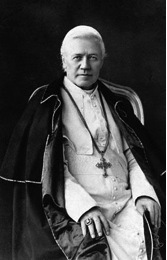 Giuseppe Melchior Sarto, Pope St. Pius X, was the second of ten children of a cobbler and postman. He succeeded Pope Leo XIII, urged frequent reception of Holy Communion, especially by children, and demanded an oath against modernism by every priest. The following excerpt is from the book “Father Annibale Maria di Francia His Life and Works” by Rogationist Father Rev. Francis Vitale. A little friend of Fr. Annibale’s prided himself on owning a medal of St. Alphonsus M. Liguori. After seeing it, Fr. Annibale could not help longing to have it. 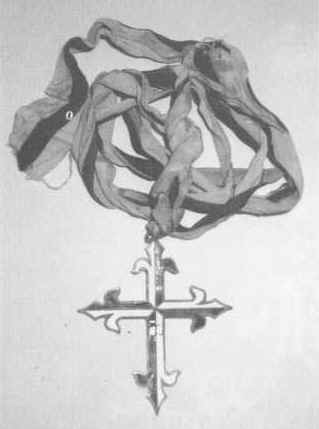 Thus he proposed an exchange: the medal of St. Alphonsus M. Liguori for many of his own. Eager to have many medals, his friend handed the prize over to Father, who in turn, gave his friend a rosary and some booklets besides the promised medals. His friend, who did not understand this type of trade, was amazed. The padre said, “I was beside myself with the joy of the medal.” Throughout his life, he wore that medal…(years later, in 1900), …the padre along with his priests Fr. Bonarrigo and Fr. Ctanese as well as about ten youths went to the archbishop asking his blessing. The shepherd blessed them tenderly, wishing the developing congregation great productivity and putting them under the protection of St. Alphonsus M. Liguori, to whom he was very devout. 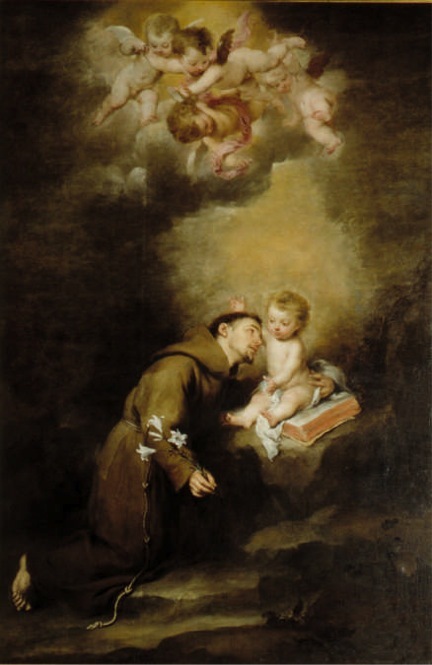 Saint Anthony of Padua—Feast Day–JUne 13th. He is a Doctor of the Church known for his miracles and being one of the greatest preachers of all times. He is known as the “Hammer of the Heretics,” “Living Ark of the Covenant,” and “Wonder Worker.” He is Patron of the Poor. In art he is depicted holding the Christ Child. He is widely invoked for the return of lost articles. St. Alphonsus Liguori—Feast Day–August 1st. 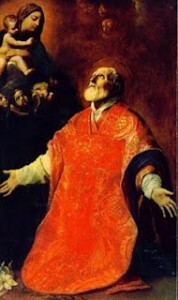 St. Alphonsus was born in Naples, Italy in 1696. He was a renowned Doctor of both Canon and Civil Law. 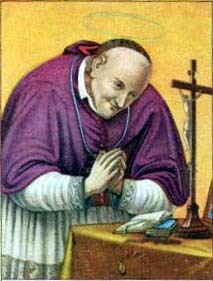 St. Alphonsus was ordained a Priest in 1726. 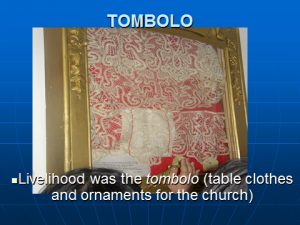 He founded the Congregation of the Most Holy Redeemer (The Redemptorists). He was chosen as Bishop of Sant’ Agata dei Goti. St. Alphonsus is the Patron Saint of Confessors, Moral Theology, and Vocations. It seems no accident that these two great Saints were both placed in protection of Blessed Annibale’s Orphanages and Religious Institutions. Luisa lived 10 years in the Orphanage of St. Anthony in Corato. These two saints are also important to Luisa’s cause because of St. Liguori’s Patronage over Confessors, Moral Theology, and Vocations, and St. Anthony’s help to return man’s greatest loss—that of the Holy Divine Will.